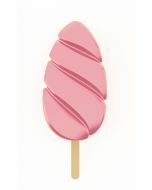 Durable silicone molds that produce frozen pops in the shape of soft serve swirls. Flexible mold makes a total of 2 - 3.5 ounce bars, includes 50 sticks and is reusable, dishwasher safe and suitable for baking up to 500°F. 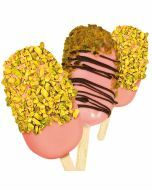 Create your own unique baked goods or prepare innovative frozen treats using frozen yogurt, soft serve, gelato or ice cream and PreGel's Coriandolina® Coatings.